Setting up a chick brooder prior to bringing home chicks is vital to their survival. Learn how to select the right size brooder box, the type of heat to provide, and your best options for feed. The process is not difficult to accomplish, but one that does take planning. Let’s get off topic for a moment. What type of chicks did you bring home? Was it a breed which is known to be a prolific layer? Maybe a heritage breed? Or one which is friendly around children? 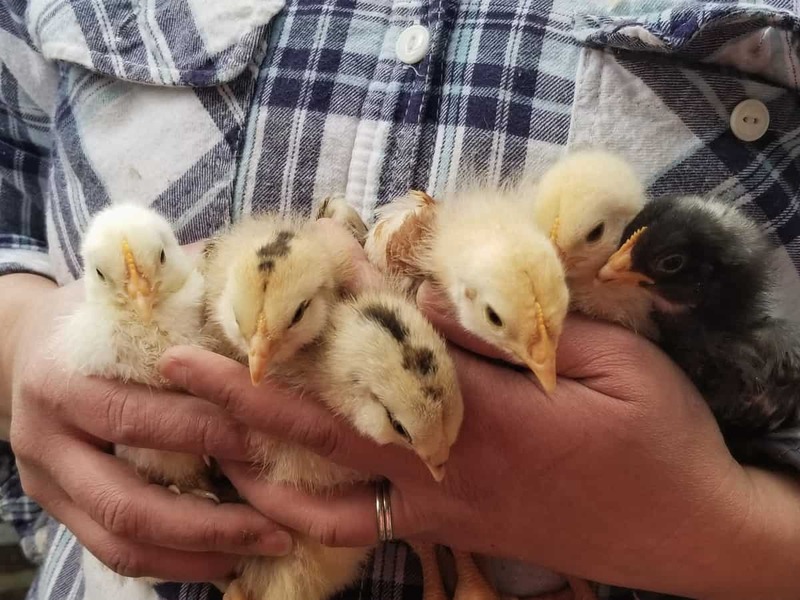 Could it be you selected chicks based on egg color? What if you haven’t selected a breed yet and are seeking the best advise on what to bring home?! Choosing the right chicken breed is much easier than many think. However, it can often be overwhelming for those who are new to keeping chickens. Begin with how many chicks you plan to raise. Next, determine the amount of eggs you’d like to receive. Then decide if egg color matters. Before saying, no, to the egg color mattering let me tell you that in fact it does matter. An egg basket is extremely beautiful with green, blue, and chocolate colored eggs in it. One of the most important factors is this, will children and chickens be raised together? There are breeds which are more docile and do better around children. 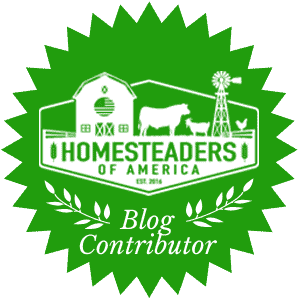 Another thing, though this blog is written with chicks in mind, everything mentioned here applies to raising all forms of poultry and fowl. 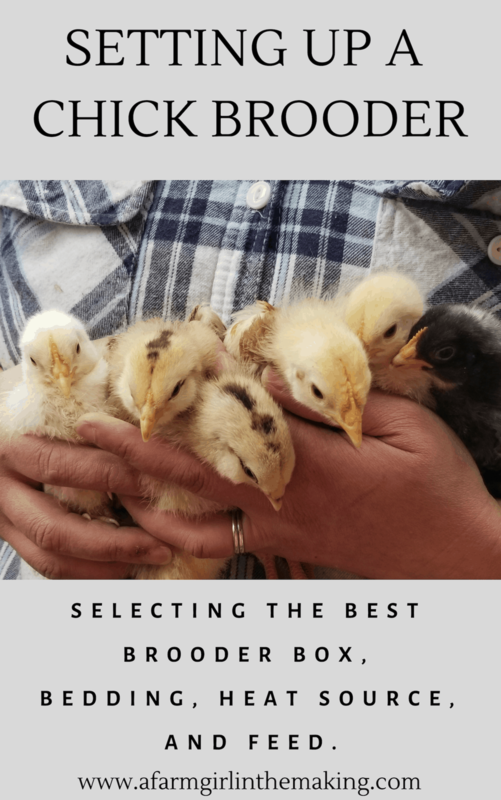 There are a plethora of options when it comes to selecting the right chick brooder box. Put your mind at ease, there is no right or wrong when it comes to selecting a brooder box. And in truth, just about anything can be made into a chick brooder, even an old entertainment stand. However, the size of the box will matter. Chicks grow fast, selecting a small brooder box means a new one will have to be fashioned within a few weeks. 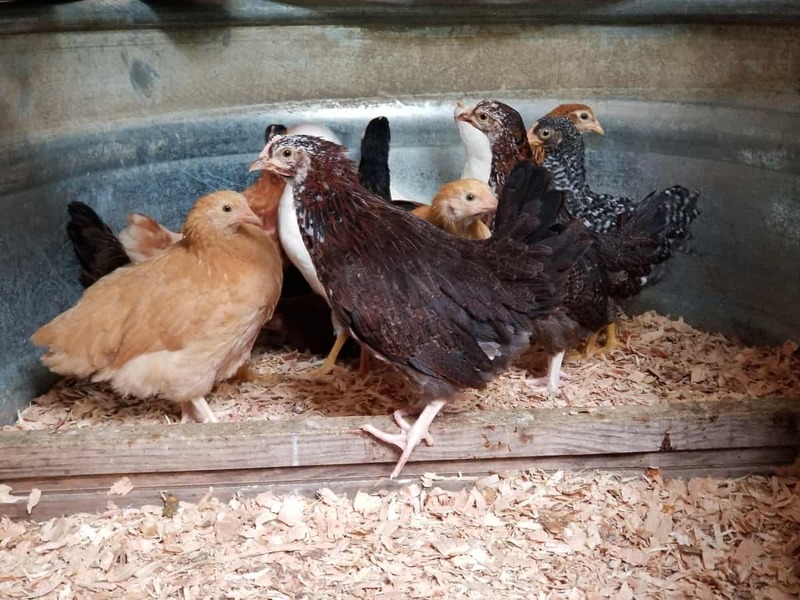 Also keep in mind, the number of chicks, or poultry, you plan to raise is an important fact when selecting the best chick brooder. Rubbermaid containers work excellent as a brooder box. The size of the container will vary depending on the quantity of chicks being brought home. 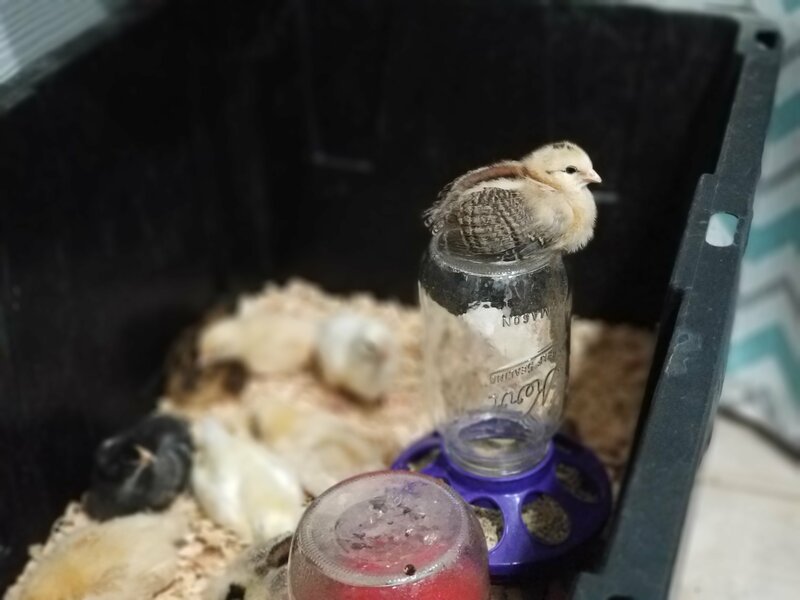 Ideally, an XL container can contain chicks up to a few weeks before needing to upgrade to a larger space. Wired dog crates work quite well. 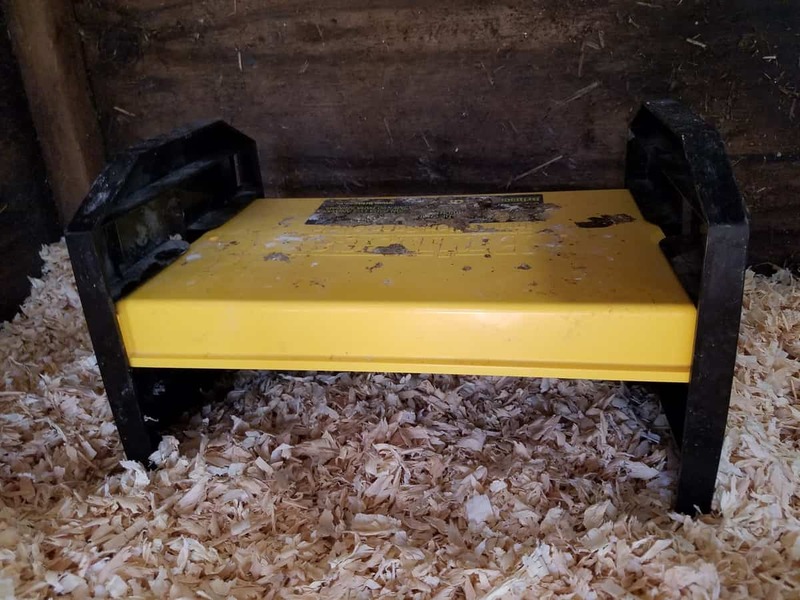 However, the sides of the crates will need to be wrapped with some type of material in order to prevent the chicks, and bedding, from escaping. Plexi glass or plywood is an ideal choice of material to use. 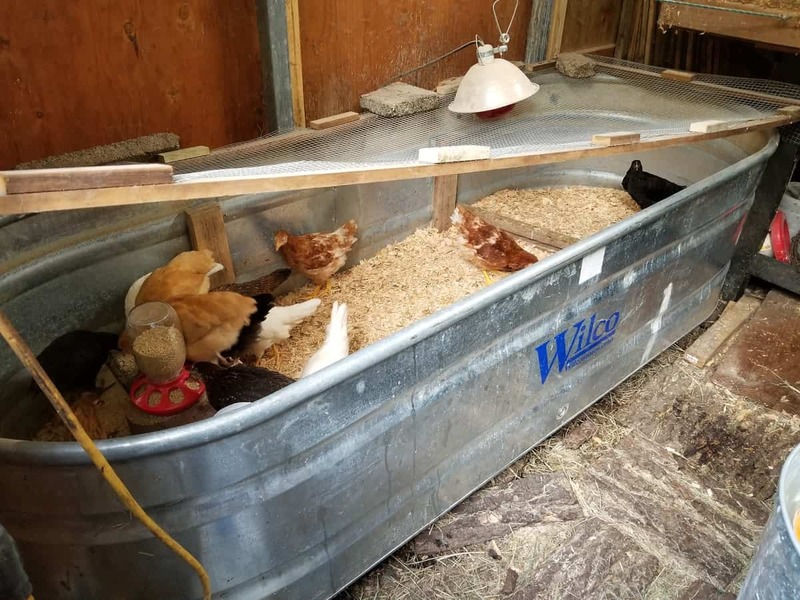 Galvanized feeding troughs are an excellent option for brooding chicks. Depending on the size selected the troughs can be used until the chicks are ready to be moved to the coop. However, a cover will need to be constructed to contain chicks from flying out. Kiddie pools work well in a pinch. Because of the height of most pools this is not an ideal item to use throughout the entire brooding processes. Sectioning off a small section of the coop in order to house chicks can also work as a chick brooder. It is important to not give chicks full reign of the coop. Too much space can cause chicks to become misplaced and may keep them away from heat, water, and feed for too long. Keep in mind, many of the items suggested here do require a larger space once the chicks begin to grow. There are a plethora of options when it comes to selecting the best bedding to use. Select bedding which prevents slipping. This will ensure proper foot and leg development. Also select bedding which is best at absorbing moisture and masking odor. 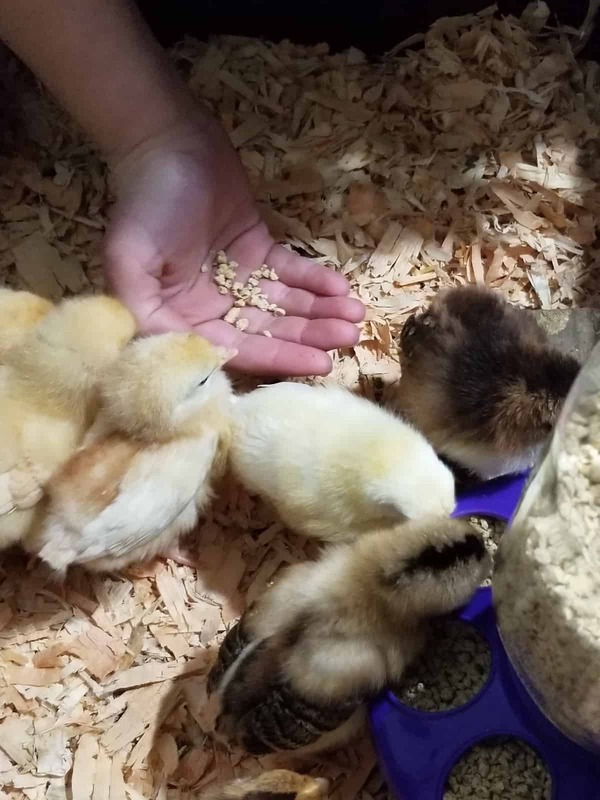 Brooder bedding should be between 2 to 3 inches thick, allowing for chicks to scratch and dust bathe without reaching the bottom of the brooder. Depending on the amount of chicks being housed, brooders will need to be changed roughly once a week. The most common bedding to use for a chick brooder is pine shavings. This particular type of shaving is practical simply because it can be found at all feed stores. 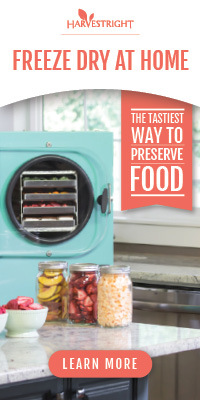 It also helps to absorb order and waste almost immediately. Place discarded material into the compost pile to create an organic product for the garden. Chopped straw is another bio-degradable option to use in chick brooders. It is exactly what it states, straw which has been finely chopped to be used as bedding. Chopped straw works quite well in a brooder, however, it does not absorb odor quite as well as pine shavings do. Another thing to consider, wet straw can retain moisture if not changed regularly and can harbor a fungus called aspergella. This fungus can then cause a fungal infection called Aspergillosis which compromises the immune system of brooding chicks and adult poultry. Chopped straw is also bio-degradable and an excellent item for the garden. Yet another excellent option for the compost pile. Cardboard bedding works well in absorbing waste and liquid, and helps to control order. Ideally, shredded cardboard should be used in a chick brooder, whereas the larger product can be used in the coop. Cardboard bedding in its larger form can cause newly hatched chicks to trip easily, causing potential injury to their legs. Cardboard bedding is also bio-degradable and an excellent item for the garden. In a pinch paper towels, shelf liners, or shredded paper can be used. Though these items will need to be replaced daily and do not mask the order caused from feces. 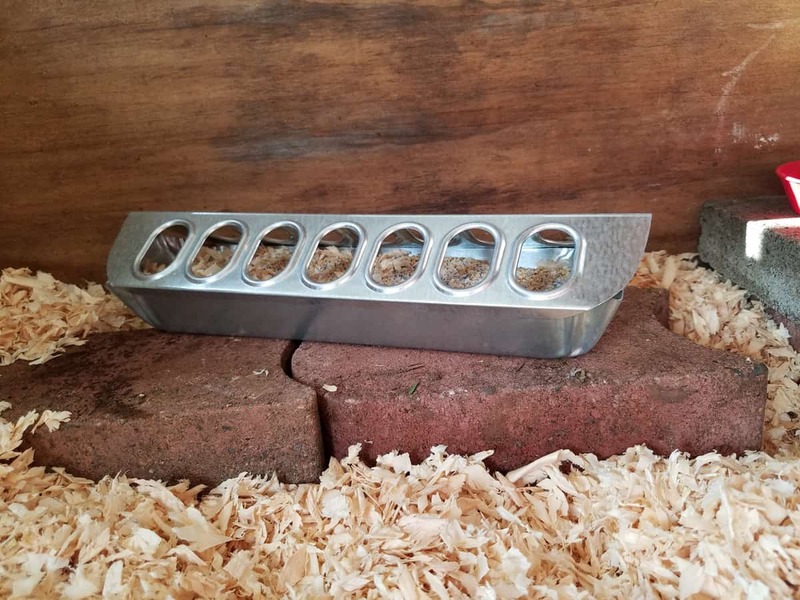 Sand is another option for a chick brooder, however, it is not something we use. Chicks have a tendency to consume anything it can fit into its beak, making sand a dangerous option. Consuming too much sand can cause the crop to become impacted which can lead to death. Secondly, the dust caused by the sand can also cause respiratory issues. Finally, sand is not compostable. Due to the delicate nature of chicks, other poultry, and fowl it is important to avoid the following items in a chick brooder. The oils released from cedar chips is very harsh and can injure the legs and skin of young chicks. Not to mention, the oil released can lead to respiratory issues. Unlike shredded paper or the other options mentioned above, newspaper does not absorb water or waste and can become quite slippery when wet. Additionally, it molds quickly. There are a few reasons as to why sawdust should not be used. The first, chicks have a tendency to consume sawdust. The second, it is so fine that it could end up in the chick’s eye. Finally, it’s messy. Very, very messy. Since there is no mama hen available to keep the chicks warm, the job falls to you. There are two options available when it comes to providing heat. Well, three. A good broody hen will often care for chicks which they have not hatched. Heat lamps can be purchased at many locations which sell chicks. Red and clear bulbs are available to be used with the lamps. As to not cause chicks to become distressed, infrared bulbs are highly advised to be used when setting up a chick brooder. The red bulbs can be left on at all times, whereas the clear bulbs should be turned off at night to allow the chicks to sleep. Since heat needs to be provided at all times, a clear bulb is not an ideal option. With that said, heat lamps are the primary cause of many barn and house fires. The heat lamp can easily be knocked down allowing the bulb to overheat what it touches, causing a fire within minutes. In order to reduce the chance of a heat lamp falling take all measures necessary to safely secure the lamp to a permanent fixture. Heating plates are the safest option to use in a chick brooder. A heating plate, or hover heater, simulates a mother hen, providing the correct temperature needed for brooding chicks. A heating plate also allows chicks to move freely through it, preventing them becoming overheated. As the chicks grow the height of the heating plate can be adjusted to accommodate their size. The risk knocking a heating plate over is very minimal due to the the four posts which holds it up. If the heating plate does happen to get knocked over it runs no risk of catching anything on fire. Brinsea makes an excellent heating plate called, Brinsea Ecoglow. I receive no commission for sharing this product, but simply want to share a brand I believe in with you. Receive 10% off any product on their website using the code, afarmgirlitm at check-out. As a rule of thumb, heat should be provided until the outside temperature matches the temperature within the brooder. Or once the chicks have fully feathered. 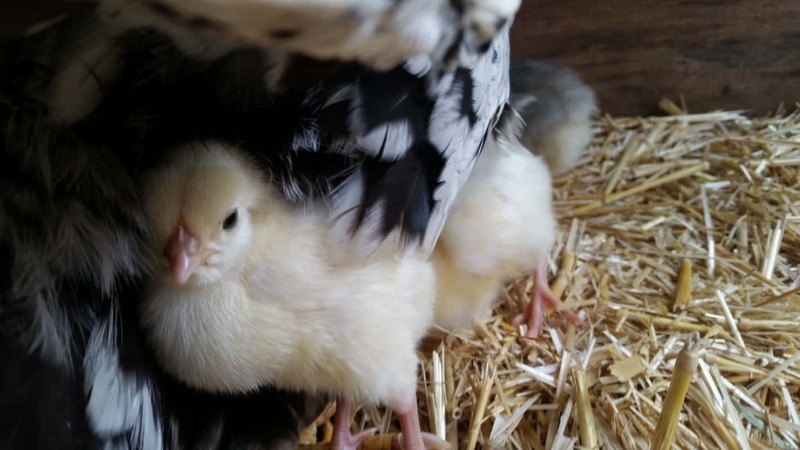 Selecting the best feed for growing chicks is not as black and white as it seems. There are a few things to consider when selecting a feed option. Unlike adult birds, chicks will need to be offered feed free choice at all times in order to sustain their growth. Feeders must be kept full at all times until they are old enough to leave the brooder. Whole grains are one of the healthiest feed options available for poultry. These grains can be offered dry or fermented. Fermented whole grains is a healthier option due to containing good bacteria; a natural probiotic which can be consumed daily, unlike a synthetic option. 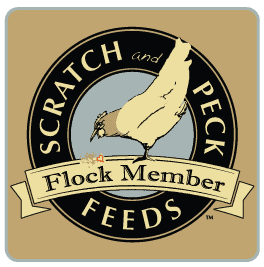 Fermented, or soaked, grains will fill a chick, cutting the cost of the feed drastically. Plus, the most of the fermented feed is absorb by the body. Why is this important? It creates little waste. 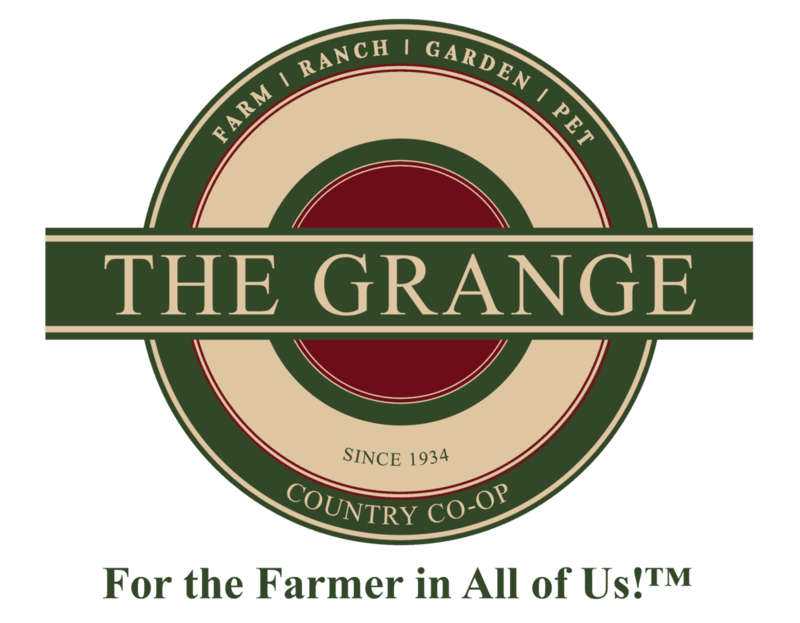 Offering whole grains in partnership with other natural options can help build the immune system of brooding poultry. Please note, chicks up to 8 weeks of age require the ability to consume feed at will. Always have a small feeder of dry grains available at all times. Chick starter feed (crumble) is available as both a medicated and non-medicated option. Most feed stores suggest medicated feed as a combative tool against the outbreak of coccidiosis. Coccidiosis is especially dangerous to young chicks which are housed in a brooder. You see, the disease spreads quickly in a small contained space, making a chick brooder an ideal playground for the parasite known as, coccidia. Medicated starter feed contains amprollium. Amprollium is a preventative drug that helps young chicks fight off the parasite until their immune system has a chance to mature. This type of feed should be offered to chicks who have not been vaccinated against coccidiosis. Also keep in mind, brooding ducklings should never be offered medicated feed. Ducklings consume much more feed than other poultry. Consuming amprollium in high amounts can be deadly to growing ducklings. Ducklings should be fed a high protein non-medicated feed with an additional amount of niacin for their growing bones. However, a natural preventative option is available for those who do not wish to use a product like amprollium. Non-medicated starter feed, in partnership with a holistic regiment, can boost the immune system of young poultry. This method is as effective as providing medicated feed, as long as one is diligent in keeping up with a holistic routine. Mash is made of ground whole grains and a few other ingredients. When purchasing mash it’s important to pick-up starter mash for chicks. Laying mash, or any laying feed, should not be offered to chicks. Mash can be difficult to consume due to be ground, adding a little water to it creates an oatmeal like consistency making it easier to consume. However, mash mixed with water can go bad quickly. Whatever is not consumed right away should be discarded. Much like fermented grains, make sure to leave a bowl of ‘dry’ mash as a free choice option for growing chicks. The decision to provide a more natural method of raising poultry begins in the brooder. Helping to build a strong immune system begins the moment chicks are brought home. Herbs such as oregano, thyme, sage, nettle, astragalus, and garlic can be offered dried or fresh. 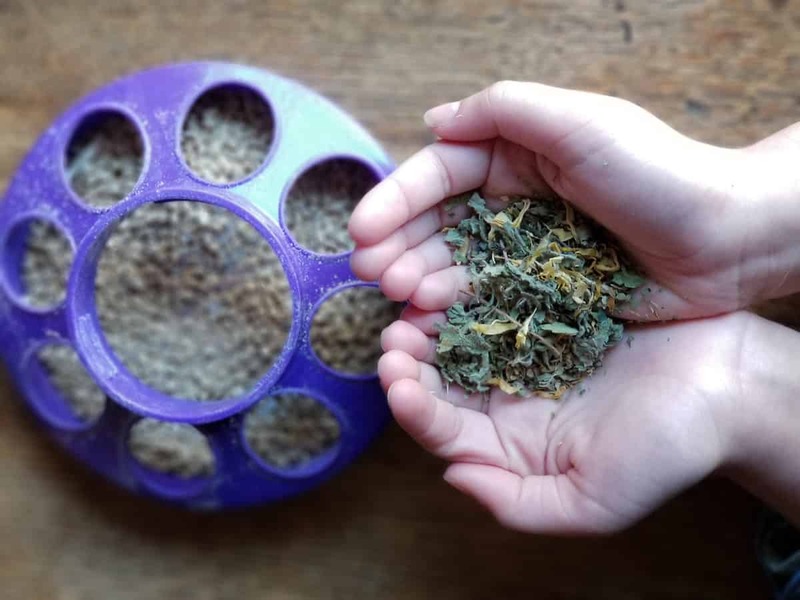 Feel free to sprinkle these items onto feed, as a free choice item, or even infused in the waterer. 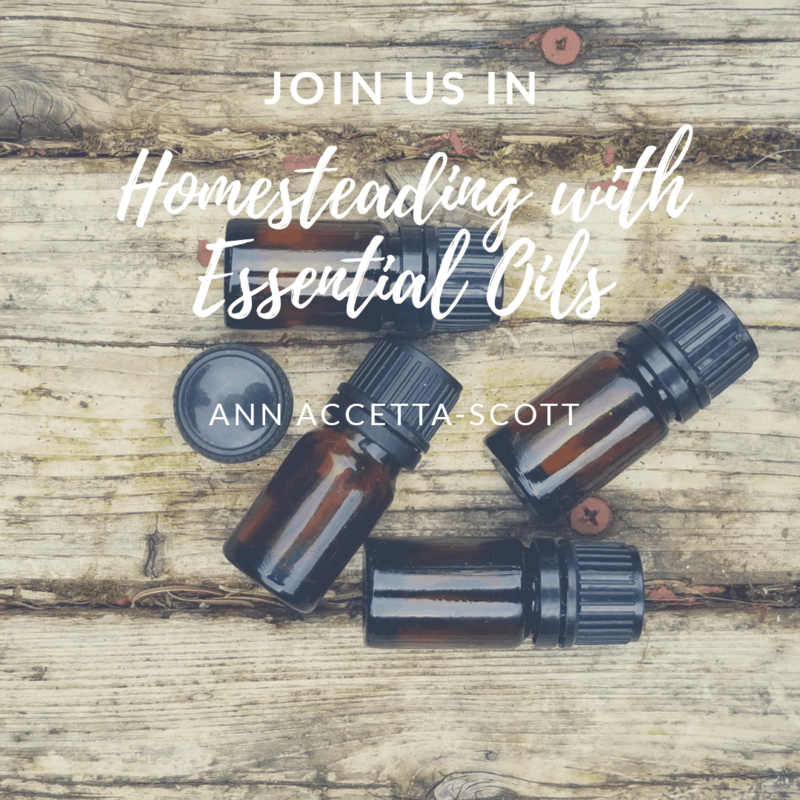 Due to their gentle, yet beneficial, nature herbs they can be offered daily. It is not necessary to offer to chick who are consuming only crumble feed. The key word is, only. Once other items such as herbs, grass clippings, and vegetables are offered, grit must be offered as well. The chick’s crop needs assistance in breaking down these items, making chick grit an ideal item to be used in the chick brooder. It is important to not offer more grit than feed. There are two methods to providing grit. The first is to offer it as a free choice item, placing a bowl next to the feed. The second is to lightly layer it between feed in the feed container. Keep in mind, chick grit should also be offered for chicks that consume whole grains, even grains which are provided fermented or as a mash. Treats such as cracked corn and scratch do not need to be offered in a brooder. These items are ideal for older birds. However, items such as meal worms, worms, dried black soldier fly larva are an excellent source of protein for growing birds. In order to forge a relationship between poultry and keeper, handle chicks daily. Take care to wash hands between handling. Never handle chicks which are housed in separate brooders without washing hands each time. Encourage, but watch closely, little children around chicks. A gentle squeeze can sometimes be a deadly one. Hand sanitizer can be harsh for chicks and should not be used prior to holding them. 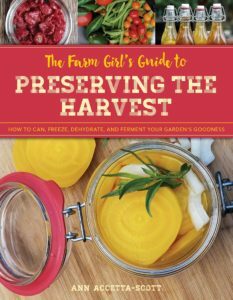 The Homesteader’s Natural Chicken Keeping Handbook: Raising a Healthy Flock from Start to Finish is a great book to have on hand. This handbook is ideal for those who desire to raise chicken without the use of chemical or antibiotics. While your young flock is young, begin planning for the next phase of raising chickens. 50 Do-It-Yourself Projects for Keeping Chickens is perfect for the individual who loves to DIY, recycle and reuse, or save money. Typically how long are they in they brooder? 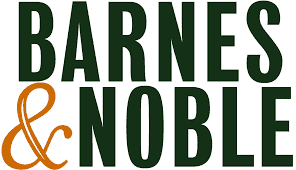 I am reading approximately 4 weeks? A chick should be kept in a brooder under heat until they are fully feathered or the outside temperature matches the temperature inside the brooder. Ideally, temperatures above 65 degrees (and fully feathered) are good to move chicks outdoors.